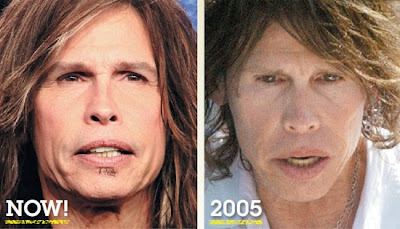 Steven Tyler Before After American Idol Plastic Surgery? Ever since Steven Tyler made his big American Idol debut, judging alongside fellow singer Jennifer Lopez, and real dog Randy Jackson, there has been a whole lot of gibber jabber concerning his appearance. But, is it the look of a worn-out rock star, a man with entirely too much makeup on, or perhaps the signs of a little cosmetic tweaking? The National Enquirer touched on the subject, and at least one board certified plastic surgeon thinks he may have received facial fillers, in an attempt to decrease hollowness around the eyes and present an overall more youthful structure. Others have also suggested the possibility of Mr. Tyler receiving botox injections in his forehead, to minimize wrinkling. For as long as i can remember, Steven Tyler has had a very unique look about him, somewhat reminiscent of a 21st century witchdoctor... perhaps attributed to his wild rock and roll lifestyle, crazy makeup, and maybe even some plastic surgery of late. He was worried about his eyes? I think he needs his eyes checked! His mouth is what needed fixing! I guess the sagging skin around his lips & jaws were done by all his open mouth screaming. You'd thought he'd want to fix THAT!